Tomorrow there will be a primary election in Ohio. You might have heard something about it. Since I never overtly discuss politics on this blog, I am going to use code names, or allegorical images, for the candidates. There are two main candidates on the Democratic side. For the first time in history, Amy and I are voting for the same person. We are both voting for Krusty. We feel that Gabbo does not have enough experience. See you in the voting booth, kids! will wonders never cease? i voted for gabbo today! i too felt that krusty was not experienced enough (but a good talker, even compared to gabby gabbo). oops, i mixed my allegories in hte previous post. 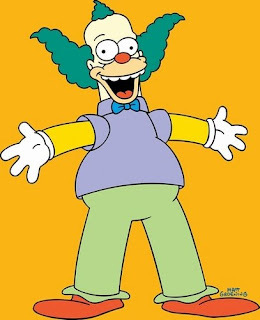 i too am a krusty klown advocate. nuff said.